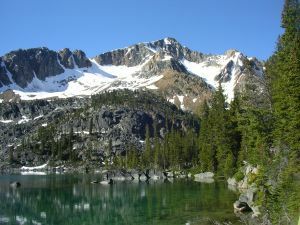 This peak is located 6.5 km north-northwest of Gott Peak on the Gott-Blowdown divide. There are two peaks, north and south with Tigger Peak being the northern and highest summit. The height of Tigger (Peak 2625) and Tigger SW1 (Peak 2612) are only 13 m different according to BC Basemap. The north summit appears to be the higher one when viewed from the south summit and vice versa. Name Notes: Named according to the A. A. Milne theme of this group of peaks. Tigger is easily recognized by his orange and black stripes, beady eyes, a long chin, a springy tail, and his bouncy personality. As he says himself, "Bouncing is what Tiggers do best". Tigger is very confident and often undertakes tasks with gusto, only to later realize that they were not as easy as he had originally imagined.